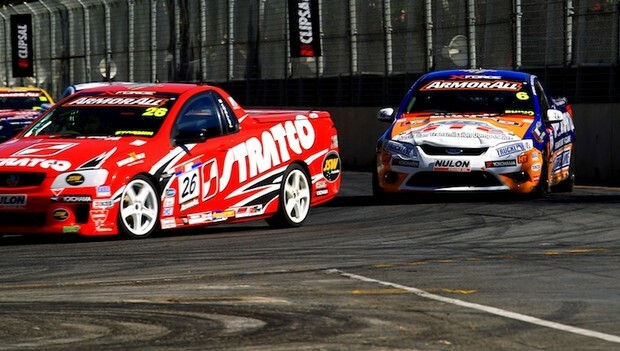 Perth brothers Rhys and Glenn McNally will compete against each other on their home track for Round Two of the Auto One V8 Ute Racing Series – protected by ARMOR ALL – as a support category at the Chill Perth 360 at Barbagallo Raceway from May 3-5. Rhys is currently running third in the ENZED Drivers Championship and is looking forward to racing against his brother Glenn for the second time in the Series. “Ideally it would be great to both stand on the podium, but obviously you always want to beat your brother and get the bragging rights at home," Rhys said. "We’re not out there to take each other out, I hope he has a good weekend and finishes up the pointy end with me." The two raced against each other at the same event last year and were also joined by brother Jake who stepped out of the Series this year. Glenn was the 2008 V8 Ute Rookie of the year and last year placed 13th overall for the Round, behind his younger brother in 8th. Glenn will be looking to rectify that this year. “It would be great to beat Rhys, but I also don’t want to take away too many of his championship points. He’s doing really well this season, he grabbed his first podium in Adelaide and I hope he’s on there again, it would be nice to be on there with him though,” he said with a grin. The two will also be representing both Ford and Holden. Rhys will steer his STRATCO Racing Holden and Glenn the JSW Australia Ford, which will be run by Sieders Racing and was steered by Charlie O’Brien at the last round. Rhys and Glenn will also be joined over the weekend by their father Gary, who is a regular mentor from pit lane; youngest brother Jake will also be on-track supporting them both. Other West Aussies competing include Richard Bloomfield, Rookies Adam Marjoram and Rhett Noonan, Allan Letcher and EzeAtm director Todd Zani. This will be the third consecutive year the V8 Utes will visit Barbagallo Raceway and all drivers will hit the track on Friday for two practice sessions and a qualifying session, followed by two races on Saturday, and Race 3 to finish off Round 2 on Sunday. Race 3 will be televised live by the Seven Network as part of the V8 Supercar television coverage from Barbagallo. The V8 Utes Series consists of a 32 Ute field made up of 16 Ford and 16 Holdens. The Series has been in action since 2001 and is televised nationally through the Seven Network. Ronald McDonald House – South East QLD is the Official Charity to Australian V8 Ute Racing. Ronald McDonald House is dedicated to helping seriously ill children and their families and provided vital help to over 75,000 families through a wide range of programs.